OHS Physics class with FSU students Nate and Alex in back and their Formula One Car frame in the foreground. In her continued efforts to help her students make sense of the complex information in the pages of their Physics textbooks, Onekama High School teacher Laurie Blevins planned a unique field trip. During a very full day, OHS Physics students were given insight into two different aspects of the field – from the study of microscopic particles of nuclear physics, to the design of Formula One racing cars by mechanical engineers. The field trip took place on Tuesday, April 3, 2012, and included stops at two Michigan universities. The day began at Michigan State University with a tour of the National Superconducting Cyclotron Lab (NSCL). NSCL is a world-leading laboratory for rare isotope research and nuclear science education. The facility serves more than 700 researchers from 100 institutions in 35 countries. Nuclear physics research began at MSU in 1958. Students learned about the major contributions that have been made in the fields of nuclear structure, nuclear astrophysics, heavy-ion reaction mechanisms, accelerator physics, beam dynamics and experimental techniques. NSCL also is the source of innovations that improve lives, including nuclear therapy for cancer patients. At NSCL, Onekama students were led into a large auditorium by their tour guide, Zach Constan, who took them on a fascinating journey of the history and future of nuclear science at MSU. The presentation was interactive and engaging -- complete with liquid nitrogen being thrown out on the floor at the feet of the students and poured over a piece of ceramic. The ceramic is normally not charged, but when “super-cooled,” it became magnetic and Zach “floated” a metal disc above it, to the students’ amazement. After the dynamic demonstration in which students learned about particle beams being produced, accelerated, smashed, and eventually captured and studied, they were able to tour the facility which employs over 500 people. “It was immense and awe-inspiring to see the sheer size of the superconducting magnets and traps which are used to conduct these amazing experiments with particles that are travelling at over half the speed of light and are so very tiny,” said Blevins. The next stop for the day was Ferris State University, with a visit to their Mechanical Engineering Technology Department. The director there, Dr. Charles Drake, graciously greeted students in one of his design classrooms and introduced them to several students who are members of the Formula Car Design Team. Alex Backe, a junior design team member, showed the students a block of aluminum he was using to design a bracket for the wheels of the car. The part was already half-machined out of the block, and he used his design software to show the students how he could analyze everything about the part before he decided on the machining. 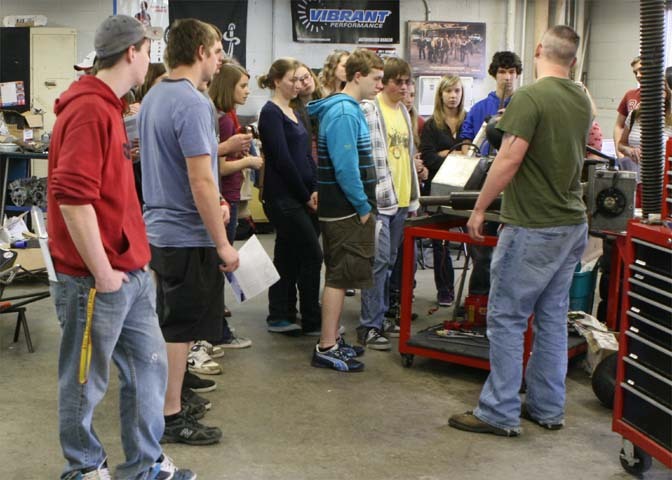 Next, students were invited to visit the lab where the Formula Car was being assembled. There, they met more Ferris students working on the team. They discussed their design and the upcoming competition in May at MIS Speedway, where college teams from all over the world will compete for the top Formula Car design for the year. Blevins plans to help her students continue to follow the progress of the Ferris team. She is planning an additional field trip in May to see the competition and let the OHS students cheer for their new friends. A dynamometer, made by Ferris students, used to tune their Formula One Car engine. 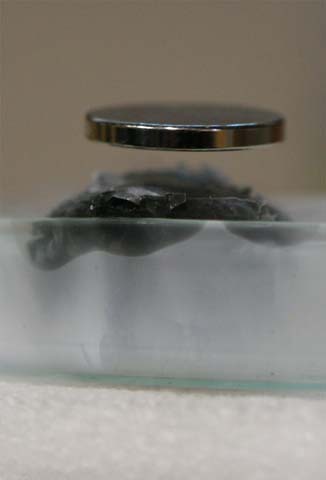 This ceramic has been super-cooled, creating a magnetic field which suspends the metal disc above it. Onekama High School Physics class at the National Superconducting Cyclotron Lab at MSU. Back row L to R: Austin Olson, Curtis McKenney, Nolan Miller, Nick Osborn, Cordell Williams, MSU tour guide Zach Constan, Emily Bergren, Kaylan Fitch, Lindsay Nesburg, Kelly Koon, Lisa Fisecker, teacher Laurie Blevins. Front row L to R: Emily Barnard, Claire Harvey, Madalyn Harvey, Mariah Hunt, Elizabeth Bergren, Kate Brauer, Brandon Morrill, Levi Mattison.